I adored A Little Something Different when I read it a couple years ago. ADORED it! 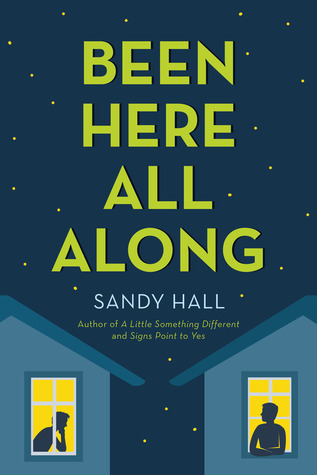 Sandy’s second book, Signs Point to Yes was just as cute and adorable as A Little Something Different (review here), so I was very excited to read Sandy’s third book, Been Here All Along. Gideon and Kyle have been best friends and neighbors since they were five years old. Gideon is in all AP classes as well as involved on various school committees while Kyle is barely passing his classes and one of the star basketball players. The book begins with Gideon realizing he’s jealous of Gideon’s girlfriend, Ruby. Trying to figure out why, Gideon creates a binder filled with reasons why he’s in love with Kyle and if he’s actually gay. Ruby finds the binder and proceeds to blackmail Gideon. Meanwhile, Kyle is starting to realize he might be in love with Gideon as he struggles through learning he has have a learning disability. Sandy Hall is known for featuring multiple POVs in a book. Been Here All Along is no exception and is told in four first person POVs: Gideon, Kyle, Ruby, and Ezra. The focus is mostly on Gideon and Kyle, but Ruby and Ezra’s POVs do make an appearance every now and then. Ruby’s POV allowed a little more insight into why she acted the way she did. Been Here All Along reminded me a lot of Taylor Swift’s “You Belong With Me.” Even the the title is a line from the song! I loved being able to connect the book to this song. Anyway, the romance was super sweet. I loved how cute Gideon and Kyle together. I also loved how everyone was so supportive of the relationship and how drama free the whole thing was (minus the Ruby thing of course). Been Here All Along is a very short book, but I enjoyed the lightness of it. Sandy Hall did a great job of keeping it entertaining and fun, which I love about her previous books. They’re all perfect summer (or even pick-me-up) reads! Overall, Been Here All Along is another cute, charming read. I look forward to reading Sandy’s future books. Thanks, Giselle! I hope you enjoy it of you read it then! Would love to win. Awesome giveaway. Thank you.